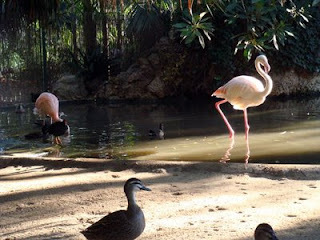 This is a picture of the ancient flamingo at the Adelaide Zoo that was attacked a good while ago now. It was in all the newspapers at the time. It seems to be okay again now. Lynettea took this picture on Monday 20 July. I had to go to my Vet today for my tests. He was pleased that I had put on some weight and my tests were the same as last time, nearly. So I don't have to go back for six months. The taxi driver didn't listen to my directions and started driving the wrong way when we finally went home. I don't think he spoke a lot of English. He turned on the GPS in the car, but it wasn't working properly and told him to keep on driving straight ahead when he should have turned to the right. It was very traumatic after my stressful time in the waiting room with some barking dogs. Lynettea forgot to bring a towel to put over my cage, so she flung her cardigan over it. Then the dogs couldn't see me. I don't know if she got cold or not. She told the Vet about how good I was catching rats and how she sat on one I had given her (it was dead, but fresh). The Vet thought it was very funny and didn't ask her why she hadn't eaten it. Maybe all humans are strange. It was good to be home, but I couldn't settle for a while after that, even though Lynettea brushed my fur and heated up my Snugglesafe. Am I Mummy’s little kitteh? I ask you! This is the type of question I get. After a hard day spent supervising not only Lynettea, but also the fish and recalcitrant birds outside my enclosure, I am expected to give therapy sessions to my human. This mainly consists of a lot of purring and sitting on Lynettea’s lap, particularly if she watches television. I don’t mind submitting to ‘a good massage,’ as she calls it, but when I get this type of silly conversation I usually elect to remain silent. There can only be one answer to questions such as, ‘are you really mummy’s gorgeous little kitteh?’ ‘Purr purr purr,’ and keep your own counsel. How about more massage under my ‘chinny winny?’ Purr, purr, purr. 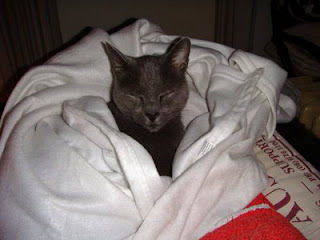 I am still weighing up whether I should advertise for another human. Now I am older and more set in my ways, it might be difficult to adjust to the habits of a new human. Would I have the energy for the intensive and prolonged training needed? It has taken years to get Lynettea to recognize and obey a few simple commands and her massaging skills could still be improved. She usually stops massaging me far too soon and I have to prod her with my paw to get her to start again. What a worrying time this is for me! Should I put up with the ancient and imperfect retainer or risk the attentions of a novice? Perhaps I will give her another chance. Another from my notebook. Just as well I found this empty notebook, as I am having difficulty getting on to the computer. Lynettea hasn't found my writings in it yet. It is difficult to paw them, but what alternative do I have? 'Lynettea was away for a really long time today and I don’t even think she was sorry. 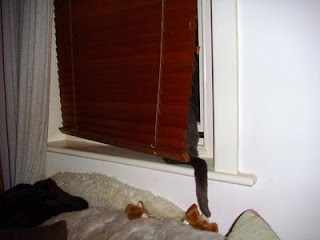 All she could say was, ‘Don’t slap at me with your paw, Diamond!’ when she ignored me to go out to the letterbox. 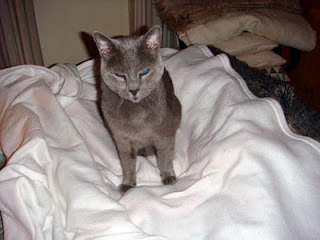 "Diligent and caring human required for tolerant and undemanding Russian Blue Cat. Training provided." After Lynettea got a few letters from the box she was sorry for her bad conduct and carried me around for a bit and then served my dinner. Afterwards I let her give me a good neck and shoulder massage.